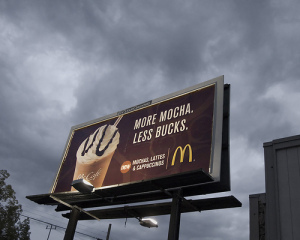 Are you looking for non-traditional ways to market your brand/property via billboards? Are you looking to implement signage that will drive the attention of consumers? Texas Stars - The Texas Stars created an incredible billboard campaign to promote the launch of their AHL franchise in 2009... Check out the team's new webpage here. 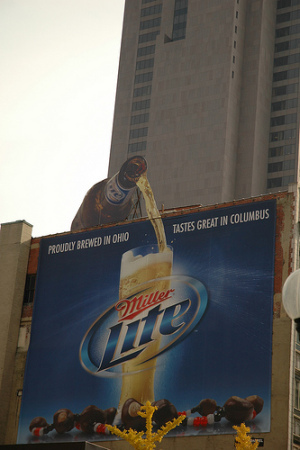 Miller Lite - Miller Lite created an out-of-the-box billboard in Columbus, OH that effectively draws consumer eyeballs... Hopefully sports business professionals will begin implementing similar billboard concepts in-venue to escape stadium clutter! McDonalds - Professional/collegiate organizations should look to mirror a recent McDonalds branding strategy to drive awareness for discounted ticket offerings. A billboard with, "Live Basketball. Less Bucks." or "More Basketball. Less Bucks." would serve as great ways to position discounted tickets in the minds of consumers. Properties can support the messaging with a creative URL (i.e. BucksBasketballForLess.com) and a captivating picture to drive consumer interest. 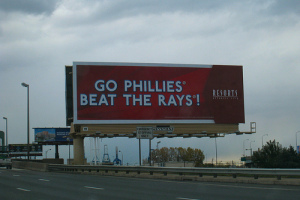 Philadelphia Phillies - Numerous companies/media outlets created unique billboard campaigns to support/salute the Philadelphia Phillies during the postseason. 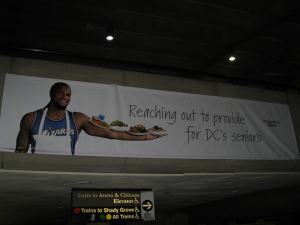 Washington Wizards - The Washington Wizards recently hit the streets with a branding campaign that promotes their organization's community-based inititatives. The Wizards' billboard campaign serves as a great benchmark for organizations looking to demonstrate to their loyalty and support for the local community!